Expect the U.S. credit card industry to see increased business activity through 2018. 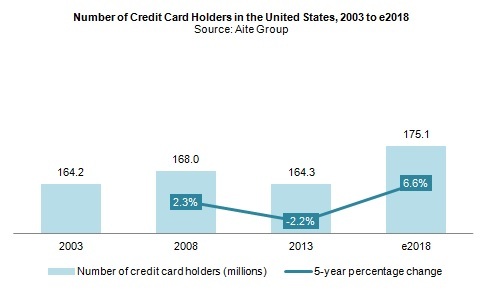 Boston, June 18, 2014 – Industry players portend the death of credit cards, but Aite Group believes that credit card ownership will increase in the next five years, fueled by the next wave of Gen Yers. Based on a Q2 2013 Aite Group survey of 1,242 U.S. consumers, this piece forecasts general-purpose credit cards in the United States through 2018, segments survey responses by generation, and explores the drivers of the coming credit card boomlet. This 20-page Impact Note contains 16 figures and three tables. Clients of Aite Group's Retail Banking & Payments service can download this report.